This month we have the pleasure of introducing to you to Meir Gelley, President and CEO of Nationwide Healthcare Services, an innovative network of nursing and rehabilitation centers in Delaware and Pennsylvania that deliver exemplary post-acute services and long-term care. In the fast-paced universe of healthcare, governed by myriad regulations and faced with the ongoing changes in CMS (Centers for Medicare & Medicaid Services) guidelines that impact people’s lives on a daily basis, it is a breath of fresh air to meet a leader with the judgment and sensitivity to know that the whole reason behind his endeavors and initiatives is the health and well-being of people— the residents at Nationwide Healthcare facilities. Highly regarded among residents and their family members, as well as the staff at each Nationwide facility, Mr. Gelley prides himself on the personal relationships he builds with each of them, interacting with staff members, engaging in conversations with residents—and showing with every interaction that he truly cares. Vital! 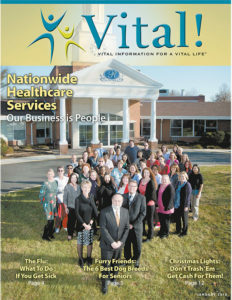 Magazine (VM): I’ve heard you say, “At Nationwide, ‘healthcare’ means more than simply supplying health services and managing conditions; caring for others touches every aspect of our lives.” How is this exemplified at the Nationwide facilities? of the entire care team contributing their best skills and talents in a well concerted endeavor, with one single focus: restoring every individual to their overall state of well-being. We’re passionate about providing exemplary care that restores our residents’ health to an optimum level— and showing compassion in our every interaction with residents and their family members. In fact, that philosophy drives our actions to such an extent that our clinical care and initiatives have earned each of our facilities tremendous accolades. VM: Can you give our readers insight into some of these initiatives? MG: Absolutely! Our Transition of Care program is a good example. 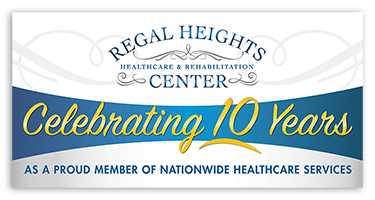 Exclusive to our Delaware facilities, we are the only long-term care (LTC) facility in the state that offers this service. Our program’s Transition of Care Navigator works personally with our short-term residents, identifying their individual needs to help ensure quality outcomes and a safe discharge home. It’s designed to assist patients who are discharged from a hospital and admitted to our facility from start to finish, throughout the course of their stay all the way to their discharge home. Our Navigator also follows up post-discharge to make sure all is going well. In terms of clinical care, the NOVAERUS air system, in place at our Brookside & Regal Heights facilities, is state-of-the-art technology that significantly reduces unhealthy contaminants, effectively decreasing airborne viruses, bacteria, particulates, mold, and odors. It cleans the air and kills all airborne germs, thus preventing us from ever having to close down the building when someone has a respiratory infection. VM: Speaking of prevention, disaster preparedness has been on everyone’s mind in light of the recent hurricanes. How do you prepare for unforeseen events? VM: Can you expand on the clinical care aspect? MG: Certainly. Case in point, the residents who benefit from the Diapulse ® Wound Treatment System™ at our facilities. VM: Can you tell us about this specialized equipment and how your residents benefit from this technology? MG: The Diapulse® system is a pulsed, non-thermal electromagnetic therapy used in the management of chronic wounds and soft-tissue injuries. Harnessed by our wound care specialists, this cutting-edge equipment has proven to be the most effective treatment for acute and chronic wounds. VM: Speaking of wounds and the use of technology: We closely followed Rep. Scalise’s impressive recovery. 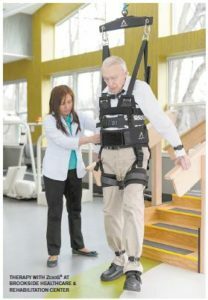 He regained his ability to walk using the ZeroG®—the same technology that your residents benefit from! MG: Yes. We’re thrilled to be the first skilled nursing facility worldwide to acquire ZeroG® with the Woodway treadmill for use in post-acute recovery care at Brookside Healthcare & Rehabilitation Center in Abington, Pennsylvania. VM: What is the ZeroG®? MG: ZeroG® is a robotic, body-weight support system which is mounted to a motorized trolley that rides along an overhead track. The beauty of this innovative gait and balance training system, designed by Aretech, is that it helps individuals safely improve balance, gait and functional independence without the risk of falling. Better yet, the advanced fall protection prevents injury by catching an individual if they start to fall. This way, people who may be experiencing weakness and poor coordination can safely use ZeroG® for a variety of real-world activities such as walking, balance exercises and going up and down steps. VM: How does it work? MG: The therapist secures the patient into a comfortable harness, attaches it to the ZeroG® robot, and therapy can begin. The amount of support is individualized for each person, depending on their level of ability and therapy goals, and can be increased or decreased with the touch of a button. VM: It seems an important component in terms of achieving the optimal level of rehabilitation that the residents would want before returning home. MG: Indeed, along with another important component: our ADL suites. The ADL suites at our facilities allow residents to practice various levels of mobility and independence in an environment that mirrors a homelike setting. We’ve found these two components combined are the most effective means to help residents transition home upon discharge. VM: What are the components of an ADL (Activities of Daily Living) suite? MG: Our ADL suite at Regal Heights, for example, is spacious enough to accommodate a washer/dryer combo, a kitchenette space with a dishwasher and a freestanding range, and two “bathroom” areas that include a walk-in shower and a tub/shower combo. The suite also includes a bed that allows residents to practice safe transfers into and out of bed. VM: What is the role of the ADL suite in the rehabilitation process? MG: Residents eagerly anticipate practicing in the ADL suites. It allows them to see how far they’ve come in the rehab process and is an early signal that their discharge date is approaching. Worth noting is that our ADL suite’s masterful design does not just make the suites “look like home,” but rather conveys a warm feeling of home, motivating residents to go through the sometimes arduous rehabilitation process, joyfully anticipating the return to their cherished routines back home. VM: That shows a lot of thought behind your delivery of care. MG: That’s just a brief overview of how Nationwide brings together the latest technology, state-of-the-art equipment, home-like surroundings, and compassionate care—and I haven’t even mentioned our famous Nationwide calendars and the tremendous impact they have in each of the communities where we’re located! MG: Especially for our residents! The original idea was to have something for family members to take home. The idea has evolved through the years; today, it’s a huge project. The initial planning starts in August and involves many different people in each community: makeup artists, hairdressers, puppeteer groups, stage and lighting stylists, photographers and the master design of our marketing experts. Our eagerly awaited calendars have become a tradition, and the distinctive voice of Nationwide: They establish our core belief that beauty is ageless. some of our residents celebrated their 100th birthdays this year), feel beautiful – and have fun! VM: This is very impressive—a high bar to surpass. MG: It involves a lot of teamwork and reflects our Vision. VM: Can you give us a preview of projects Nationwide is currently working on? MG: One of our most exciting projects right now originates from Nationwide’s recent acquisition of Bayhealth Milford Memorial Hospital in Delaware. Nationwide plans to transform the 22-acre site into an innovative, multi-use, healthcare-focused community that will include a wellness pavilion and a Nationwide Healthcare facility, complete with our signature, elevated standards of care. 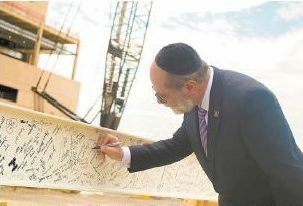 We’ve built a wonderful relationship with Bayhealth, and at a “topping out” ceremony a couple of months ago, as I signed the ceremonial beam at the site where Bayhealth is building its new medical center, our shared intention was clear: To continue our mutually supportive relationship long after we open our new facility in Milford. VM: Your commitment to your residents and your core values are certainly evident in everything you do. How can readers learn more or schedule a tour? Development, at 215-479-0072, email Meg at mjudson@nationwidehealthcare. com, and learn more about us at www.NationwideHealthcare.com. Awarded the Person-Centered Care Award by Quality Insights of Pennsylvania (presented to only one facility out of 700 in PA), and accorded the Best Employer Award presented by 1199c Training and Workforce Governor’s Initiative, Nationwide Healthcare Services stands out as an innovative force in the healthcare industry at large, unique in the many ways it positively impacts the communities it serves. *Full generator back-up available at Regency Healthcare & Rehabilitation Center in Wilmington, DE; Sterling Healthcare & Rehabilitation Center in Media, PA; Brookside Healthcare & Rehabilitation Center in Abington, PA; and Renaissance Healthcare & Rehabilitation Center in Philadelphia, PA.